No, this post is not about pottying. I’m not one of those parents (ok, I totally am. In fact I think I’ve posted about potty at least twice). This post is all about my buddy’s dictionary. He’s got so many great words, I need to write them down because they are changing so quickly. babow (butter): Me: do you want butter on your toast? CJ: babow. yeah?! pooooow? 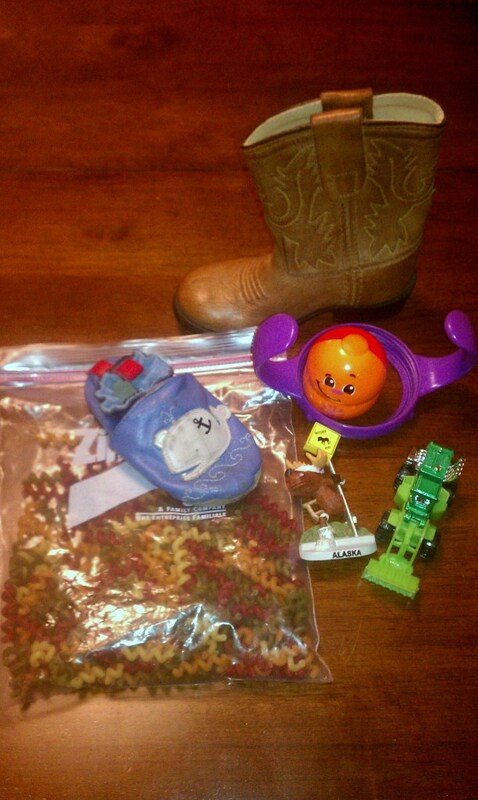 (pouch): Kid’s obsessed with veggie pouches. OBSESSED. At least he gets his fruits and veggies, right? baybee (belly button): He loves to stick his finger in my belly button and say “baybee?” For a while there, I was really offended and thought my kid thought I was a little too thick in the middle and saying I had a baby in there. noyse (nurse): Said with much more frequency and urgency (and with a few tears) these days since I officially weaned him this past weekend. 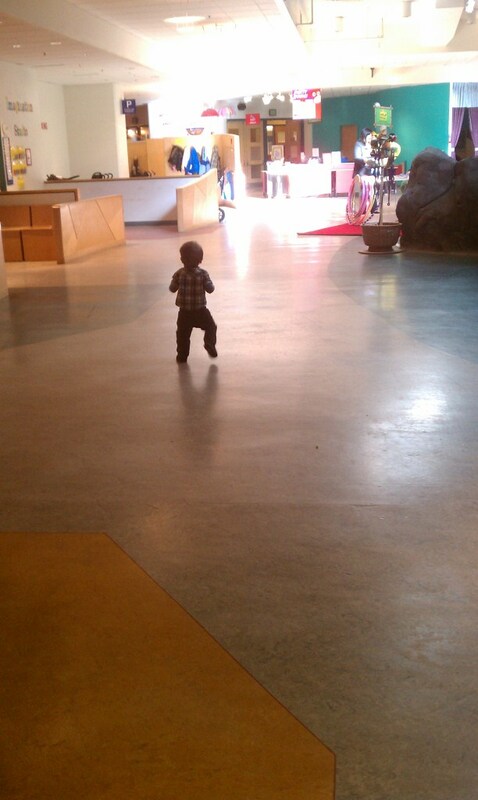 gaahgo (gotta go): As soon as he decides he needs to do something else he’ll say “gotta go” and get on the move quickly. pweeeeeeeeese (please): We’re using our pleases so often now! bupple? (bubble): This is how we got over our fear of baths. Daddy is a bubble machine while mommy washes the dirty baby. Now we cannot have a bath without bupples. awa (agua): We’re not sure about this, but he doesn’t use the word water at all, but does use agua/awa. No one explicitly taught him this, so we think he’s a genius and learning Spanish on his own. ama (airplane): Sitting inside having lunch and you hear jet overhead? No? Carter does. And he’ll point up and tell you. zhooooop? (soup): His favorite food in all the land is a lentil vegetable soup. It’s loaded with spinach, carrots, green beans, onions and garlic. He gets furious if you don’t offer him the whole can of soup. And you pay the price if you cave to his “pweeeeeeeese?” because he’ll be up all night with a gassy tummy. And his daydoo will remind you of all these things the next day (there you go, I’m talking potty). moooooon (moon): Every evening we step oshide to check the mail and say goodbye to his nanny (lots of kiss blowing and buh byes). Once she is gone, we begin our hunt for the moon. 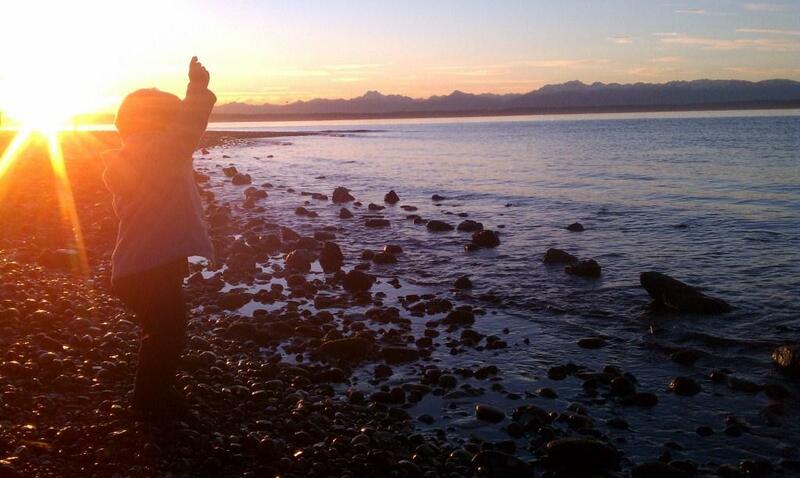 If it is not visible due to clouds (check: it’s february) or not int he right place on the horizon he says “uhoh! uhoh? ooooh no! mooooon?” until we go inside and read the moon book. bah (bus): Said with glee every time a noisy bus passes by. gock (clock): He apparently knows where every clock in the city is. If we’ve been somewhere before and start to walk in the door he’s already saying “gock? gock?” over and over and pointing because he knows it will be there. I get regular indian rug burns from him while tries to examine my arm clock. bopple (apple): Loves to eat bopples. biapah (diaper): In the morning he talks all about his biapahs. melmo (elmo): Especially his biapahs that have melmo on them. nigh nigh (night night): Carter’s indication that he is tired. He makes sleepy sounds and curls up on the floor. neeklash (necklace): We love to grab on to mommy’s neeklash. oof oof (woof woof): What dogs say. wooooooooow: He’s been saying wow (the extended version) like everything is the coolest thing he’s ever seen. Over Christmas when he was waking up in new places every day he would say “woooooooooow” every morning. Interesting one this week with a high powered LED flashlight (sorry, PopPop but the kid loves flashlights) and the holder for my bike tire pump. Seems like that should belong on my bike in the garage. But when I ask CJ questions, I usually get a response of “yeah? !” (not helpful). 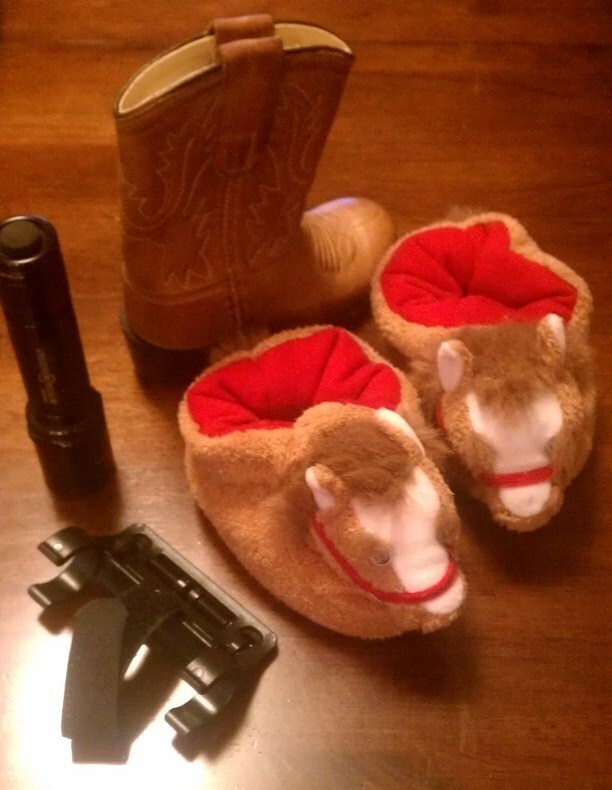 Don’t forget the horsey house slippers and the ever-present boot. High Pressure is such an interesting pair of words. Going back to work? Less fun high pressure. A weather system in February? PURE AWESOME high pressure. We had a bunch of perfect sunshine-see every detail of every mountain-50 something degree days over the last week. 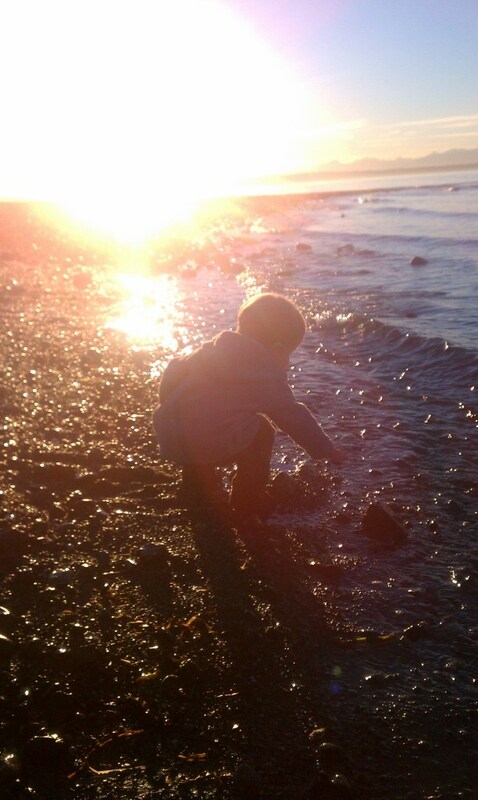 What’s even better about those days is they fell on my days to spend with CJ. We spent the morning playing at the Children’s Museum, which is a total blast! 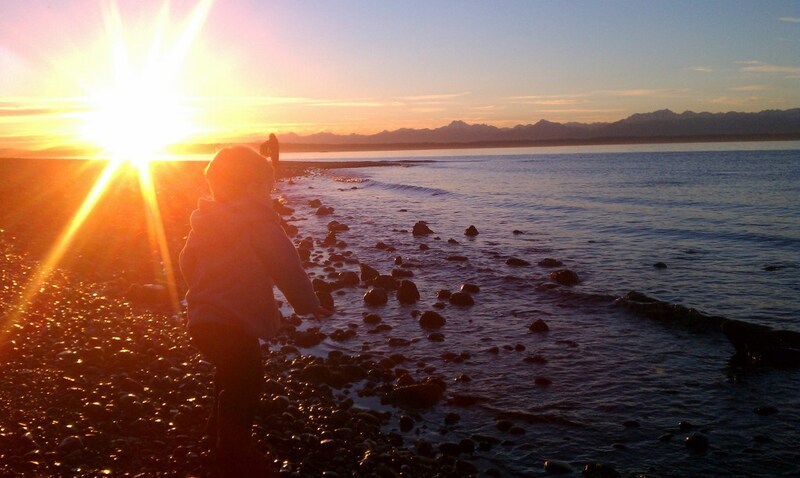 I highly recommend you visit if you have wee ones and are in the Seattle area. I’d say we explored about 1/3 of it in the two hours we were there. We had a special obsession with the “cork box” – a sandbox full of broken cork and stuffed turtles and other accouterments that left my child giddy with joy for at least 45 minutes. Maybe next time we’ll hit up the rest of the museum! 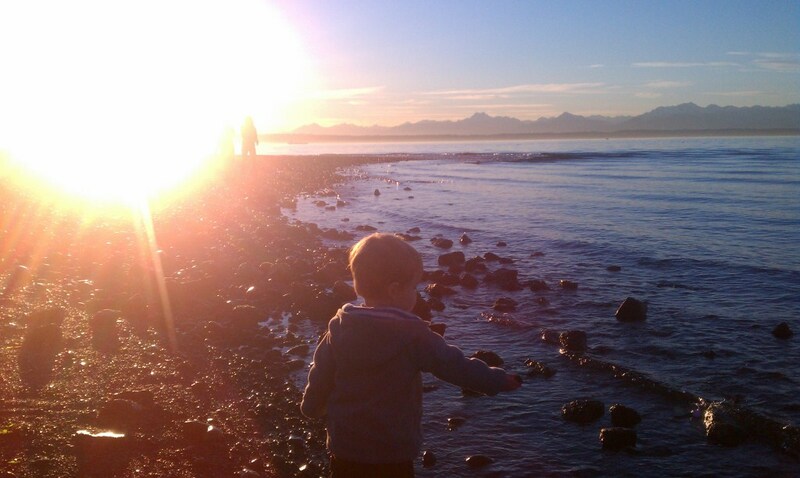 After his “nap” we headed off to the beach to take some pictures throw some rocks and catch a sunset. First, we hang out amongst all the logs and observe all the chaos that a warm, sunny February day brings in the Pacific Northwest. We can get a little crazy. Most wear inappropriate clothes (you can’t see the 6 year old kid behind CJ who is in friggin underwear – it’s warm for Feb, but it’s STILL 49°) and act really crazy. Traffic gets horrible everywhere and best of all, people smile at you for no good reason. Then we decide to use our new language skills and point at or pick up everything while saying it’s name 1500 times (in question form for good measure). Then we grunt and moan and whine while mommy asks 14,000 questions waiting patiently for their beach buddy to say “yeeeeeeeeeeeeeeaaaaaaaaah??! !” and head toward whiney direction…the water. Because all things should be picked up and dropped in the bigger pond of something liquid. Grilled cheese square? Drop it in the soup. Goldfish? In the pot of boiling pasta. 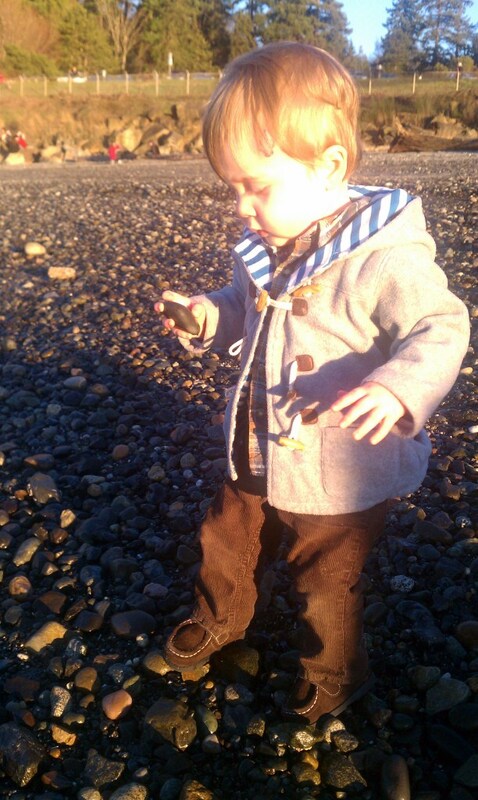 Rocks & pebbles? In mommy’s drink. 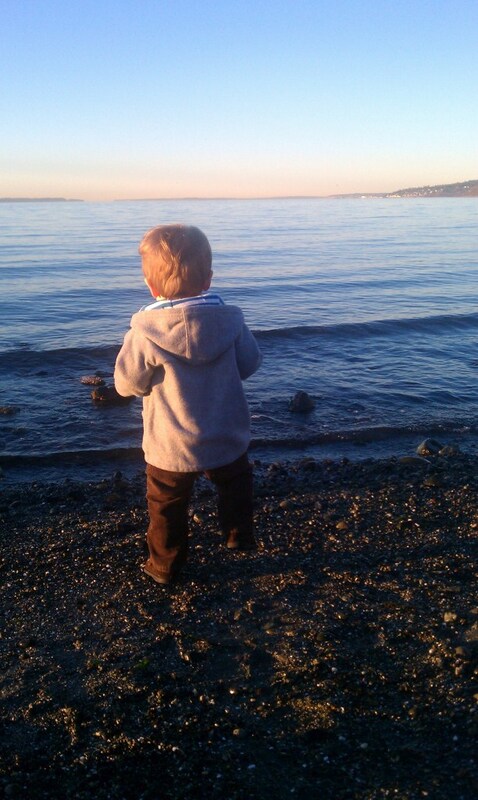 Or the Puget Sound. You get the idea. We could do this until the choo choo comes home. 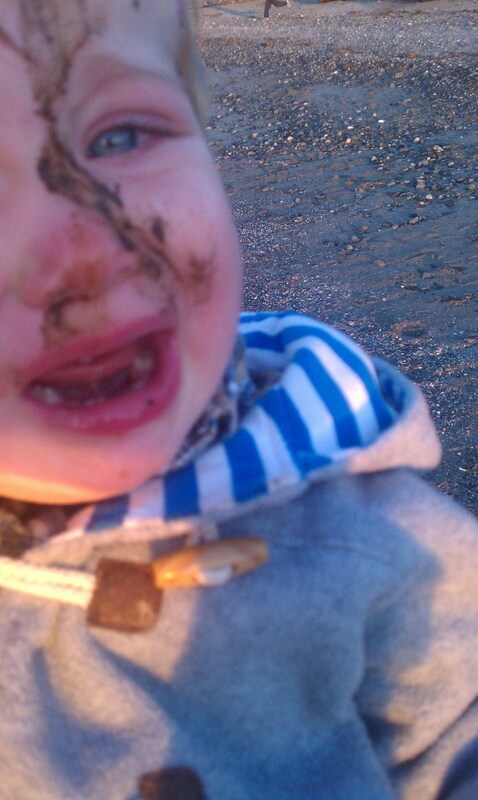 Unless of course the choo choo is so exciting, that it causes you to fall face first into the seaweed sludge and rocks. And your mom is cruel enough to take a picture of you (after making sure you aren’t actually hurt, of course) while you are clearly in distress. 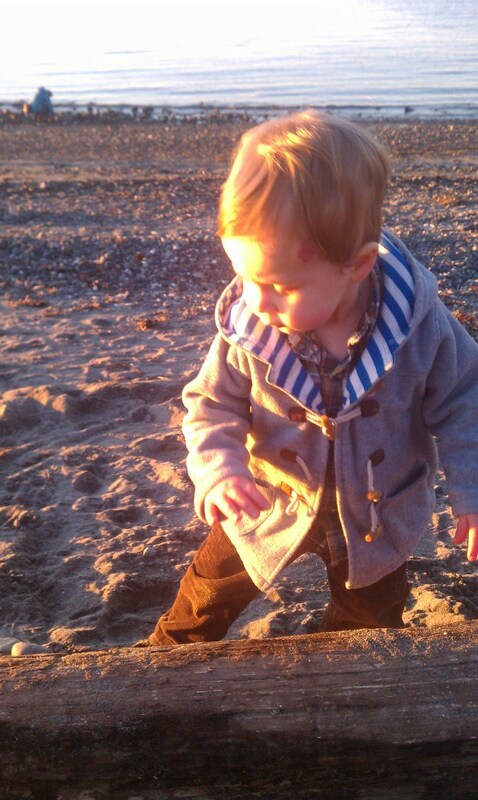 After we snuggled, talked about the choo choo and cleaned up his face, he was obsessed with getting back to the “awa” to throw some more rocks. His mama was not stopping him. 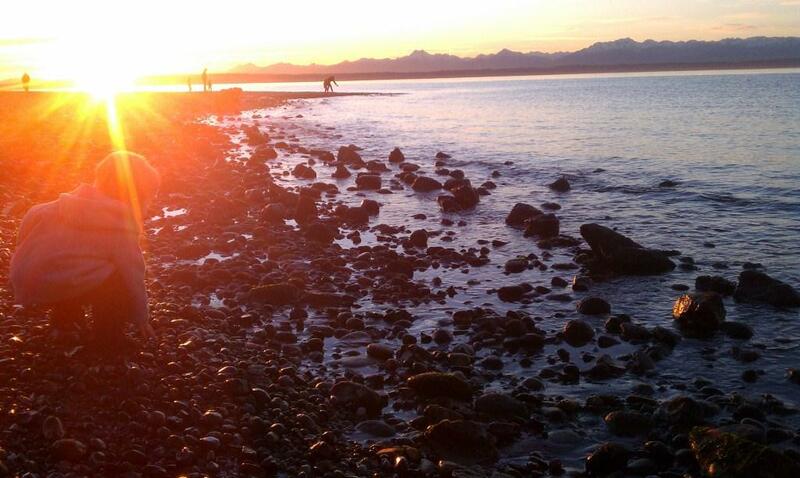 Take one final dip for the day behind the Olympic Mountains. 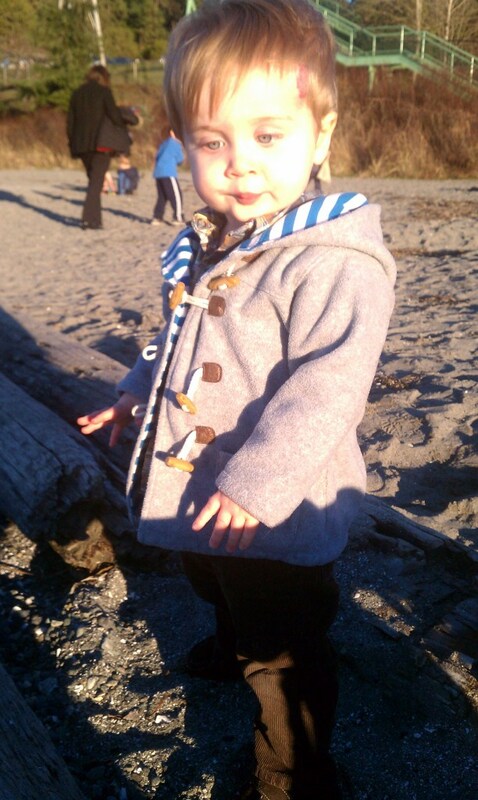 Carter has been walking a little here and there since October. But he isn’t always super confident about it. He really wouldn’t walk in public or outside a place where he was super comfortable. Until recently. 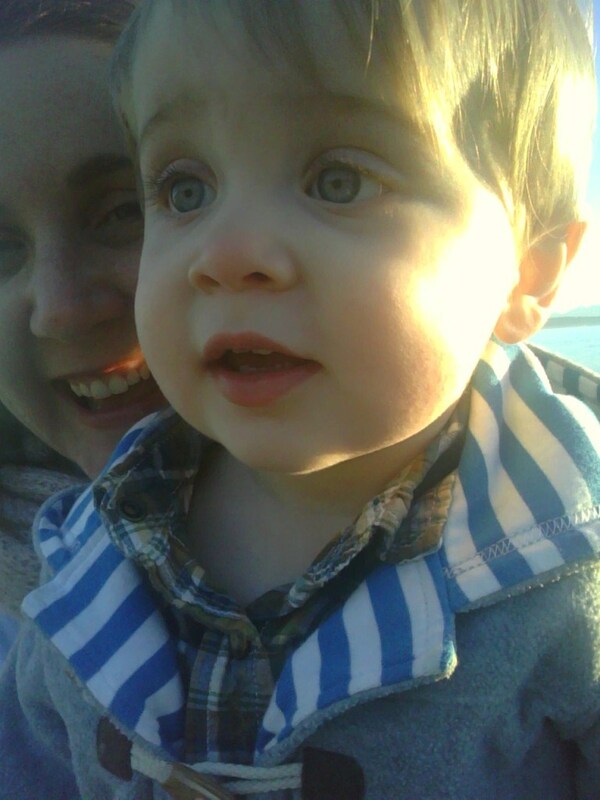 And now, he gets REALLY MAD if you try to put him in a wagon or stroller. 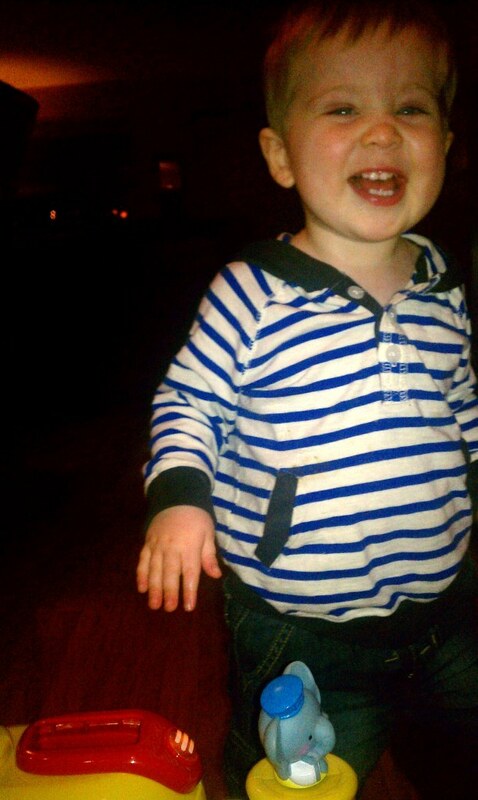 You say “wanna walk?” and he says (in the midst of wailing about the wagon) “yeeeeeeeeeeeah?! !” He also has taken to pushing your hand away when you offer it.